I bought a bag of this from Andy at MICE. Roast date 14th March. Got around to opening it today and pulled a shot. My oh my. Haven't had an espresso this well balanced, tasty and fruity in a while. I was hesitant when I opened the bag as the roast looked very light but its fantastic. Brewed on Alex Leva and using Kony-e it has remarkable body and mouth feel for such a light roast. The aroma of the beans is sheer bliss, berries and more berries even my wife picked up on it easily. It's quite crunchy on the bean chew but when you look at a split bean its roasted the same all the way through. Hats off to you sir, thanks Andy. There's a thread going on about God shots at the moment. Grab a bag of this and you're guaranteed many if you love them fruity. Andy, chokkidog, sprezzatura and 1 others like this. Yes. I had some at Round Bird can't fly in lilydale. Chum creek roasters (via Andy?) . It's fantastic. Never got to take some home to put through my Alex, sadly. Andy, chokkidog and sprezzatura like this. I have 2.5kg of green on the way. Guess I'll try 200g at CS8 to start - thank you! Andy and javabeen like this. Ardi CS8+ (on left next to Aceh and Chimanimani). Blueberries; butterscotch aroma and chocolate. Absolutely delicious through pour over. Our new favourite! Andy, Dimal, javabeen and 1 others like this. ernieg777 and sprezzatura like this. Dirt; chicory; sawdust; rancid creme brûlée and hydrochloric acid. ... some of our guests prefer it - keeps my ego in check. I get the empty jars to put coffee in. Andy, DesigningByCoffee, Dimal and 1 others like this. But did it have floral overtones? The only thing floral about it is the marketing. My first roast with the Ardies. Im thinking this is far too dark..
What setting can I use on the Behmor which gets me to first crack without so much colour? I've done a couple of roasts with this now, both blended 2/3rds Ethiopian Sidamo with 1/3rd Peru Ceja De Selva (post blended). I pulled the sidamo right on first sign of second crack, and the Peru just into second crack. You can smell the sidamo when you open the bag and the shot is amazing. Given I think my Behmor is finally (many 100's of roasts) wearing out (can only just manage 320gm roasts now on 1P2b), I'm calling it as my best roast yet. Certainly by far the most aromatic blend I've produced to date. DesigningByCoffee, Dimal and chokkidog like this. I do a warm up (100; start) then 200g Ardi @ P1 until first snap then P2 until FC goes for :45 to 60 seconds then COOL and crack open the door. I shoot for Ardi at CS7+ and 8 because it tastes amazing through the Hario! Doesn't look too dark to me. Do you have a CS card? What brewing method will you be using it with? Im going to be running these through the brazen as my espresso machine is getting serviced. I had a look at Andys roast and his was lighter than this. I haven't sectioned any beans yet. That's where the CS card comes in handy. Not sure if they are still available. Idea is you can rate your beans against a number which correlates to bean colour. This reduces the confusion with camera settings, lighting and monitor or screen colour. 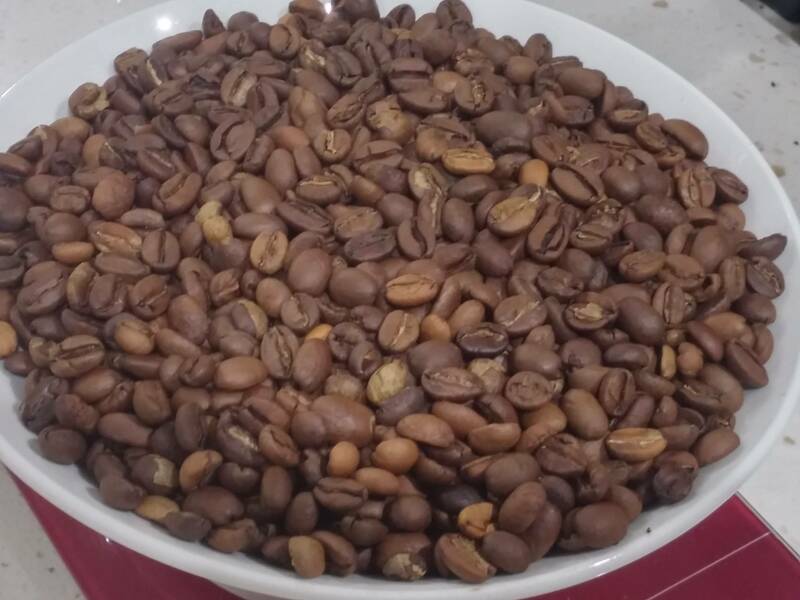 Received the Ardi just last week and in my first roast I overshot the mark, it smokes a lot and I checked before first crack from memory and found it still very light, continued on and ended up pulling it at start of second crack but had too much heat in it, see dark beans pic. It doesn't taste awful but the butterscotch is slightly caramelised and the lighter floral tones are obscured. The crema is a little bitter. But it just hinted to me that there is so much more to this bean. So I searched for Sidamo Ardi and checked this thread today before starting the second roast, and aimed for something close to the suggested CS8. When it was well and truly smoking blue I had a look again, still too light but I toned down the heat (that is the gas camping stove, I roast baby roaster style with a stainless cocktail shaker) and continued till a rolling first crack and stopped there. I think this is a much better result, see next pic. Such a fantastic community and resource here at CS! Really look forward to tasting it in the cup next weekend. neofelis, don't get too hung-up on chasing a roast colour from a different roaster. The Behmor will roast darker on the outside than my drum roaster for the same roast-depth. A breadmaker and heatgun will roast darker again. Grind some beans and put it away as a roast depth reference, ground coffee gives you an average of roast depth right through the bean and a better indicator of what changed overall. I think your roast looks pretty-much on the money and a weeks rest should have it popping berries. This bean has been in the Brazen on and off for the last couple of months and I keep going back to it. Stunning brewed coffee everytime. DesigningByCoffee, Dimal, ernieg777 and 3 others like this. This is my favourite pour-over coffee. It's so amazing that I had a client ask me to buy a Behmor, 2.5kg of Ardi and a Macap M2M for him JUST for the Ardi! Any roasting tips? For my KK? Well the Expobar Minore sparked into oblivion on the weekend, I think a heater element has gone as it trips a RCD immediately after the pump has filled the boiler when starting up. That was before I had a chance to trial the lighter roast but today I have used the lighter beans in a pour-over after I found my stainless Vietnamese style filter that I used to take camping. Didn't expect much but after adjusting the grind to Filter on the Vario I am very pleasantly surprised with a spice floral tone that I would describe as a mix of clove and daphne. Totally different from the caramel darker roast espresso but rewarding the senses for sure. Glad I got this green bean! bosco and sprezzatura like this. First time roaster, after reading descriptions of this bean decided to give it a go. Roasted a few batches of this coffee in the last week. First two batches (100g each - CS5) in a popper, stopped slightly after first crack. Tasted a few days later and amazingly floral with sparkling berry acidity. (Had as espresso and pour over). Third batch (500g - CS9/10) roasted in a newly made Corretto, and took it all the way into second crack (to get my preliminary roast profile). Haven't tasted yet, but will do so over the next few days. As espresso/ristretto (21g dose; 30g yield), the acidity was a bit much, as I had roasted this a tad lighter than I would have liked. As pour-over, it was initially a bit muted initially when too hot, but opened up to a creamy/peppery candied blueberry taste after it cooled a bit. 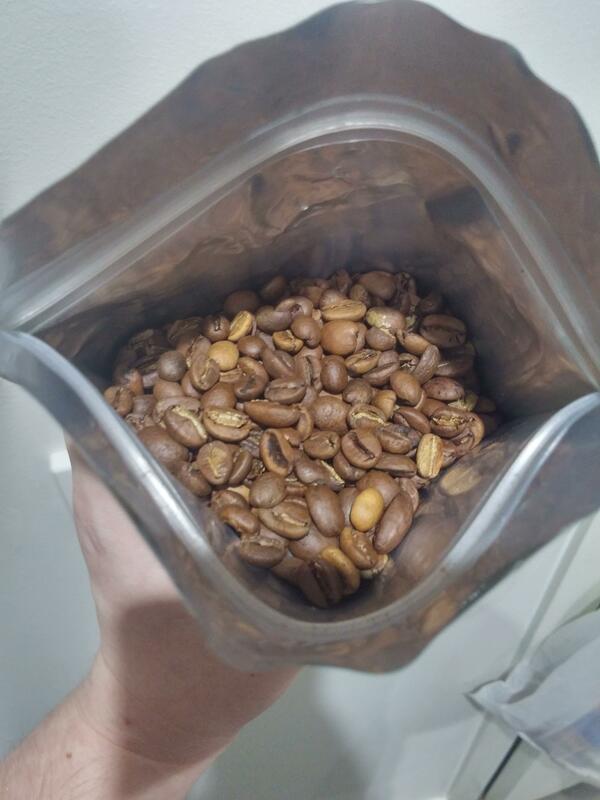 Anybody else have roast profiles they would like to share? Suggestions on which temperature to stop roasting at? I tend to roast beans like this slightly faster (but not as faster as a Harrar) than I would my centrals/indos etc. And possibly dropping it a fraction before second crack (1-2°) so earlier than my usual too. But as with all roasting, now, you've moved to a corretto (good choice sir!) you'll have to take notes on each roast and then adjust your profiles by flavour - not by trying to match someone else's profile as all roast dynamics and individual preferences will change person to person. Dimal and davidxcoffee like this. Thanks for the profile Matt. If I'm reading it correctly, your roast took 19 minutes from start to stop? I don't have it in front of me but I think I stopped at 14-15 minutes. Didn't measure my cooling time or temperature though, just started rolling the beans around between sieves. Looks like I might need to slow it down a lot more. My heat gun only has two settings, 350 and 550 degrees, and I was using the higher setting. I'll keep a lookout for some professional roasted Ardi as well for something to compare against. Also, Andy - your description: "they explode with red berry flavours and smell like you just tore a blueberry muffin open." was right on the money. Heaps of berry fruit notes. Yep - around 19mins, but this was for a 750g batch in my roaster. Things like insulation, lids, and gun fan speeds all play a big part in how long a roast should be. If I was roasting a 350g batch of these beans, my time would most likely be around the 16-17min mark. I've found that the reduced airflow in big batches means I need to slow down larger roasts a little to get a comparable taste result. So I wouldn't slow your roasts down too much - just try and stretch it out a minute at a time and then trial the results. Dimal, davidxcoffee and ecrangle like this. Had a shot this morning. Was expecting it to be horribly bitter and burnt because of the colour of the grounds (much darker than my usual shots). Turns out, this was one of the sweetest most amazing shots of coffee I'd ever had! I made another shot to see whether this was a fluke. It wasn't. The second shot was just as amazing. Full of rich sweetness - toasted coconuts, slightly acidic but clear. I finally get what the difference is between sourness and acidity. I let the rest of the shot cool a bit and made a flat white. Works amazingly with milk as well, but definitely better without. Went back to the shot after a few minutes and the sweetness seemed more subdued, the acidity still bright and clear, now revealing more candied berry notes. Very surprising. Thought I had wasted a batch due to the colour. DesigningByCoffee, Dimal and matth3wh like this. Just goes to show - taste everything! That land into second crack can be an eye opener. I've found the Eth Gambella goes from smooth and buttery to port & raisins with just 1-second crack extra into second crack, so well worth experimenting. About to roast some Ardi,I will use this to get me started! On to my 4th bread machine roast with this very versatile bean. Used a "standard" profile for my first roast as a baseline and have reduced the drop point gradually and regressively from originally just at SC at 220C down to 218C (at 18 minutes) for my most recent roast. At the 218 there is barely a whisper of SC but it is there. This roast is the best of the 4 so far as espresso. A delightfully pleasing extraction, every bit as per Andy's description, spot on plus. Brilliant fresh (after 2 days) and development over time is equally impressive. Great buy Andy. Thank you. Plan to roast this up very soon... Any tips for profiles on the "old school" Behmor 1600 (no panel update?)? Might do two roasts, a 300g 1lb setting, P3 C taken to literally to the very first pop of SC (done more as a gauge for when SC occurs..), and the next roast same weight and setting but roughly 45s-1m before SC..
P3 is a slightly slower ramp up isn't it, I tend to get great results from P3, but happy to experiment if any ideas get thrown about? Roasted this over the over the weekend. I have the 1600+ but I went with P1 200g (with actual weight 250g) to first hint of first crack then dropped the heat back to P for bout 20 sec, then P2 until end of first crack. Then took it for another 30 seconds or so. On the lighter side of roasts. Huge notes of blueberry, cherry and honey. Next one I will take slightly longer which I think would suit espresso better. Ah ok right, thanks for that. Not sure if the settings can be changed midroast for the old Behmor model, usually on first crack I'll open the door a fraction to help bring the heat down a bit, but not sure if I can change midroast from P1 to say P2? It is opposite in manual mode, so P1 in manual mode is zero power. I believe you can get a replacement panel so you can upgrade the 1600 to the 1600+? I think Andy may even sell them, but looks like he is sold out at the moment Maybe if check ebay if Any won't have any back in the near future? As for the roast, I think a slightly gentler approach for the Sidamo would be better. might bring out more floral notes over the chocolate. I really do love this bean and dare I say it may be a new favorite. I'll check my roasting notes when I get home tonight and let you know any extra thoughts I had during the roast. Roasted up some Ardi for filter brewing a few days ago (8min. 30sec. 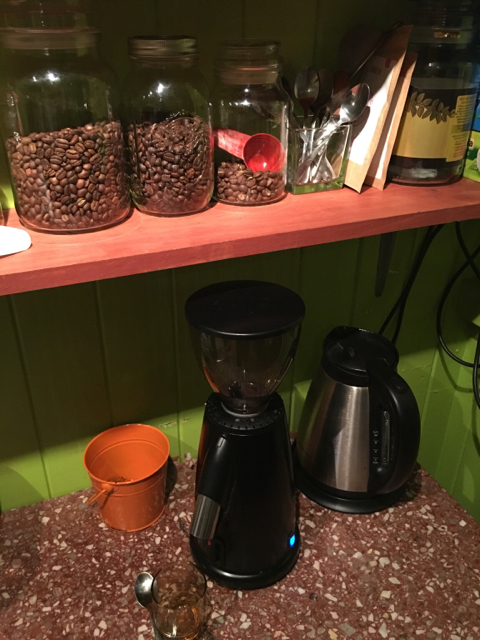 to vigorous first crack and then cooled), today I loaded 23g into my 18g VST and extracted 70ml in 30seconds at 95C into a tulip cup and then topped up for a long black. It had a light/medium body, sweet with rich vibrant berry notes and a pleasant lingering finish. 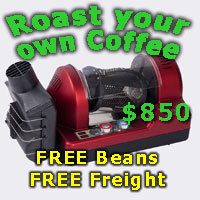 Have been using it as a highlight in one of my pre-mixed blends, it sits in the background early days and then amazing berry aromatics flow from the grinder -- a great bean at all roast levels!!! DesigningByCoffee, Dimal and WhatEverBeansNecessary like this. Agreed. I love the sweet flavours of natural processed coffees but this is standout and a favourite of mine. Andy, Dimal, simonsk8r and 1 others like this. I posted a quick note in the Beanbay thread before I saw this one. I don't normally use such a high quality bean with milk but gave it a try given the notes. Totally Terry's Chocolate Orange I had a laugh. Love it. I agree with the fruit/berries as above but boy I got this Choc Orange hit in milk. Great bean. Ordered this one as a brown bean for my Christmas drinking. Love it. I have tried it as a shot, long-black and Piccolo and it works well in all of these forms. It is fruity without the unwanted acid of some beans in lighter roasts. I'm intrigued as to the type of fruit flavour I am getting. Marmalade and tangerine came immediately to mind on the long-black with something more subtle I can't quite place on the shot. I don't eat much fresh fruit so I'm not as quick to identify the particular flavour as folks who eat a lot of it. I used this with Soy milk this morning (for Daughter, not me) and was surprised to find it split the milk. Pity because the Soy steamed really well. So that extra bit of acidity made all the difference it seems. Interesting, I don't add soy,almond, rice, potato or whatever the latest non dairy is but I wouldn't have thought the Ardi was "that" acidic. Certainly not in the same league as a Kenyan, PNG or some of the centrals that can clean plaque off your teeth. Still a stunning coffee though. Smells amazing tipping the green beans into the roaster, they smell even better when I empty them into the cooling tray and when I bag them-up. A fortnight later they peak in the bag and explode on the grinder. Just a pleasure to work with these. Got this pre-roasted (wanted to treat myself), and for awhile was having a little trouble with it. Was always just a bit too sour, pours were a bit pale, and felt it was maybe a tad too light a roast for espresso (as I was fitting 23.5g into my basket, whereas I can only usually get 22g or so max, and 23.5g was still quite shallow in the basket so can easily fit more). Extractions were also quite odd and there many dead spots, something I hadn't ever experienced before with any other bean with this grinder. But after resting the beans more, and increasing the yield (pushing it up to 1:2.25, or about 53 grams out), it is absolutely delicious. The sourness has gone, it's juicy, blueberries galore, and it's much more balanced. Still stranger looking extractions than I'm used to but it doesn't seem to matter now. Last edited by simonsk8r; 29th January 2019 at 07:53 PM.